KUHN Farm Machinery has added a 4-metre version of its combination min-till seed drill to its expanding range of ESPRO trailed machines: the new ESPRO 4000 RC is a 4-metre working width, foldable machine which enables seed placement and fertiliser application in one pass. The ESPRO 4000 RC joins KUHN’s existing line-up of trailed min-till drills which includes the 3-metre rigid ESPRO 3000, the 4-metre and 6-metre foldable ESPRO 4000 R and ESPRO 6000 R, and the foldable combination ESPRO 6000 RC. Originally launched in 2015, the ESPRO range has become a firm favourite with medium to large-scale arable farmers and contractors thanks to the low power requirement and high output capacity of the various models: the CROSSFLEX coulter bar, which is the key to the ESPRO range’s high working speeds, ensures seed is accurately placed at up to 17kph: each coulter is mounted on polyurethane blocks which allow the individual coulters to closely follow terrain contours. Ground pressure and seeding depth adjustment are controlled hydraulically. This ensures a consistent seeding depth across the machine’s full working width and enables accurate seeding to be carried out at high forward speeds. 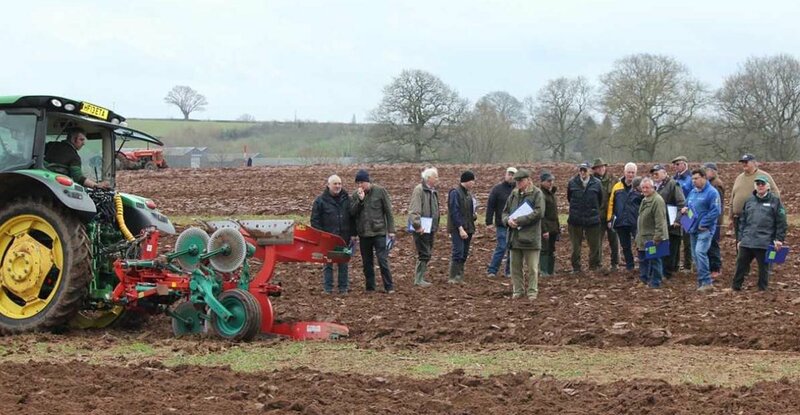 In common with other machines in the range, the ESPRO 6000 RC uses two rows of cultivating discs followed by a single row of large diameter (900mm) press wheels which are offset and fitted with specially designed deep tread tyres to create an ideal seed bed. An additional row of single disc coulters behind the working discs delivers fertiliser or a second seed variety directly in front of the press wheels and equidistant from each of the two main rows of seed: placing fertiliser to this level of precision ensures the seed receives the necessary nutrients during the early stages of growth whilst also minimising the risk of the young plants being scorched by coming into direct contact with the fertiliser. The ESPRO 4000 RC is fitted with a 4,000 litre, twin-compartment hopper which is divided on a 2400:1600 litre (fertiliser:seed) basis. Two separate metering and distribution systems provide several potential modes of operation including the ability to sow: one seed variety from both compartments; seed and fertiliser from the separate compartments; two main crop varieties; or a mixture of two seed varieties with each sown to a different depth. An optional set of front press wheels with in-cab pressure adjustment can also be added to provide a level soil surface ahead of the working discs and to prevent the machine from sinking into lighter or wet soils. Retail prices for the ESPRO 4000 RC start at £97,124.